The Bellaire Boulevard Reconstruction Project is a joint project between the Southwest Houston Redevelopment Authority (SHRA) and the City of Houston (COH). The SHRA was responsible for the design of the project. The COH will be responsible for the construction of the project. The project will consist of several types of improvements along the Bellaire Boulevard corridor from Rogerdale Road to Osage Road. Below is a summary of the different types of improvements and upgrades that will be constructed with this project. From September 2012 to December 2012 => Improvements to Beltway 8 frontage roads and construction of temporary asphalt pavement in the current median (for future use) will be completed. 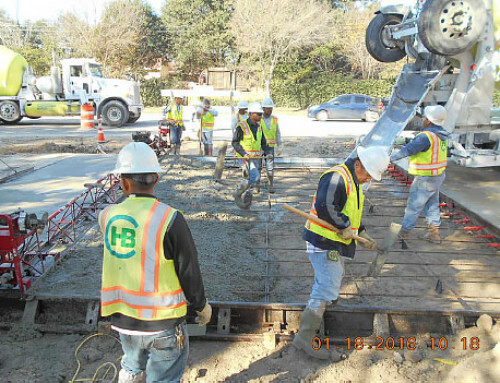 From February 19, 2013 to July 2013 => Reconstruction of Bellaire Blvd eastbound lanes and installation of some segments of proposed underground utilities (storm water, water distribution lines and wastewater collection lines) will be completed. From August 2013 to December 2013 => Reconstruction of Bellaire Blvd westbound lanes, including the addition of the 4th westbound lane and installation of remaining segments of proposed underground utilities (storm water, water distribution lines and wastewater collection lines) will be completed. From January 2014 to September 2014 => Installation of hardscaping elements, landscaping elements and other miscellaneous items throughout the project limits will be completed. Note: The contractor, Total Contracting, will work as planned through the holiday season. They will be off on Christmas Eve (Dec. 24), Christmas (Dec. 25), and New Year’s Day (Jan. 1). Driveway access to be maintained at all times if possible. Any driveway closures for construction will be coordinated with the property owner a minimum of 7 days prior to closure.